The subject of Journal Impact Factor has given rise to discussion and debate since the statistic was first made available in 1975. Throughout the years, Clarivate has maintained a consistent stance, emphasizing that Journal impact Factor is a specific metric for gauging a journal's recent citation influence within its particular field. 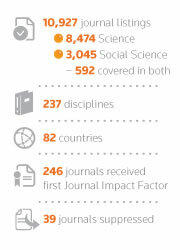 it is not intended to serve in isolation as a definitive or ultimate measurement; the Journal impact Factor is but one data point, which must be considered in context and in combination with other elements, such as the overall citation patterns in the field in which the journal is categorized. In recent years, some observers in academia and publishing have criticized instances in which Journal Impact Factor figures, subsequent to their publication by Clarivate Analytics, have been misused. There are instances where the Journal Impact Factor has been improperly extended to the evaluation of individual authors. The faulty inference is that if an author publishes a paper in a journal with a comparatively high Journal Impact Factor, this is somehow an automatic reflection of the quality of the author's work—and even, by extension, of the author's institution. This is a misuse of the Journal Impact Factor that is not condoned by Clarivate Analytics. The company instead recommends the use of other citation-based metrics in InCitesTM specifically designed to assess the output and impact of people, papers or programs. There are many authors who make legitimate use of Journal Impact Factor in targeting their manuscripts at high-impact journals in their specialty areas. Publication in such journals, however, and the Journal Impact Factor of the journals themselves, should not be hastily treated as some kind of surrogate to replace detailed, informed assessments of individual authors and their published research. Clarivate has consistently sought to promote understanding of the Journal Impact Factor, its limitations, and its proper application.